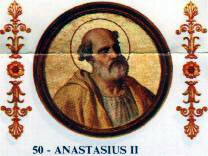 Pope Anastasius II (died 16 November 498) was Pope from 24 November 496 to his death in 498. He was an important figure trying to end Acacian schism, but his efforts resulted in the Laurentian schism, which followed his death. Anastasius was born in Rome, the son of a priest, and is buried in St. Peter's Basilica.